I'm interviewed in this month's InternetWorld on XML-RPC and SOAP. There are a few typos (SOAP doesn't run over IIOP, for example) and there are some things I say that I have no idea what I meant. Also the interview was done in December and some things have changed, but for the most part it still accurately reflects my point of view. Best line: "Can we date before we get married?" Julian Bond: "There's a revolution going on beneath the surface of the internet. This revolution already has a name, 'Internet 3.0' and protocols, SOAP and XML-RPC." David Strom: Weblogs, a Window on the Influential. "Now e-mailing a writer is common, and weblogs represent the next step." BTW, if you or your company have a story about The Two-Way-Web, please post it in the discussion group on the site. Read the home page to get an idea of what I'm looking for. White papers, thoughtfully reasoned and possibly self-promotional pieces that explain where you see the Internet going as a writing environment. I'll run the most interesting ones as stories on Scripting News. Via Dan Gillmor, here's Andy Hertzfeld's list of things that Nautilus does that haven't been done before. Note: I'm flying to Seattle late this afternoon to attend the Hailstorm briefing at Microsoft tomorrow. Updates will be sporadic between now and the end of the week. While I'm gone, Jake is going to work on the SOAP interface with Manila. First, he's written up a problem we've encountered with WSDL. A common practice is to use structs to return a variable amount of information from a procedure. Apparently WSDL has no way of representing procedures that work this way. Second, he's written sample scripts that allow a workstation to emulate Radio's outliner in editing a Manila site. We'd like to see two specific projects come from this. An editor that runs on Unix, perhaps emacs or vi, that through Apache, allows a user to create and edit stories and update the home page of a Manila site in the same natural way that Radio works with Manila. The other project is to write a .NET application that allows the CLR to be a great editor for Manila text in the same way. Do they have text editing tools in .NET? Would you like to use them to edit a Manila site? This is the next wire in the bootstrap process that leads to interop. What's interesting about this is that you don't need to implement the whole ManilaRPC suite to get this very important level of functionality between server-based content management and better-than-the-browser text editors on workstations. All you'll have to do is emulate the functionality in other scripting environments. Then we'll have a very important kind of interop, between writers on all these platforms. That's when we become transparent, when the technology ceases to be the most interesting story, when we're delivering benefits to real people. This is what Internet 3.0 is about. 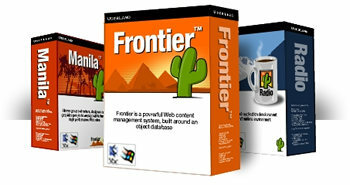 If you scroll up and down Scripting News you'll see shots of all our products, Frontier, Manila and Radio. Our designer Bryan Bell has done an inspiring job in adding reality to these all-electronic products. Now, a final shot of all three products together. I guess this amounts to advertising. I hope it's not too crass or commercial. Enjoy! Last update: Wednesday, March 14, 2001 at 3:39 PM Eastern.